Mary was joined by a group of home educating parents who had been to see Owen Paterson earlier in the day, when she presented him with the North Shropshire Petition at the end of one of his surgeries. 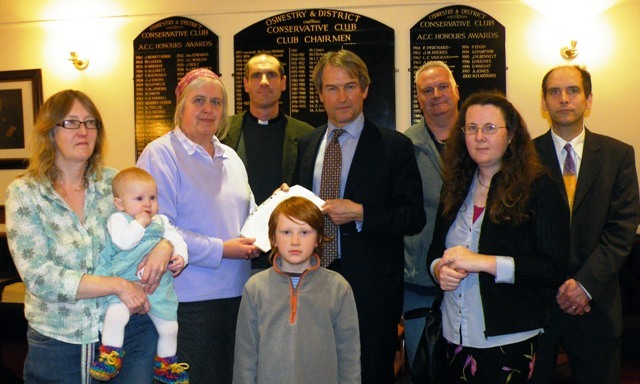 Mary Hardy, co-ordinator for North Shropshire, hands over the Home Education Petition to Owen Paterson MP. Also present were: (Back Row) Rev. Paul Darlington, Neil Hughes, David Bird, (Front Row) Alexia Owen-Sinclair with Flora & Felix & Trudy Kinloch. Owen Paterson has now posted his own report of the handover on his web site. You can read it here.